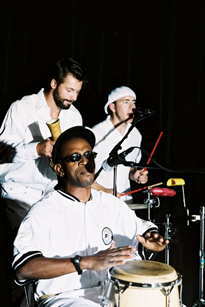 Percussion Teaching Tour in The US Including Portland, Oregon Through July, 2003! PRICES: PRIVATE CLASS $40-$50/HR OR GROUP CLASS $15-$25/HR. From: "Rick Ray - bobbytorres.com"
As you can see from the list below, the Bobby Torres Ensemble has some huge gigs coming up in the next two months, including a Saturday night berth at the Rose Festival Main Stage. Except where noted, these dates all feature the large ensemble with horns and additional vocalists -- just like on the CD! Speaking of the CD, "It's Heaven I Surmise," it's amazing. Each time I listen I hear more subtle touches that Bobby has created. It's being played quite a bit on KMHD 89.1, Portland jazz station. You can hear samples of all the tracks online at http://bobbytorres.com Miguel plays on many tracks and the CD can be purchased for $16, free shipping. (You can also find a Webspecial: 3 CDs for $36 -- the extras make great gifts! JUAN DE DIOS, founding director, choreographer and dancer, AND MIGUEL BERNAL, lead percussionist singing and percussion, both from Conjunto Folklorico Raices Profundas. At UA School of Music, Room 170 (enter from the back of the building at the loading dock. First door on the left.) DO NOT PARK behind the building. Parking is available on the street or in parking lots nearby. Good parking is available at Speedway and Park on the north side of the street. PRIVATE INSTRUCTION AVAILABLE - $40.00 per hour. Including Portland, Oregon January Through April, 2003! Don't miss this exciting opportunity to study with one of the world's leading Afro-Cuban percussionists with experience teaching Americans! Omo Iré, live Cuban culture..."La Rumba Cubana"
(La Cañita, Portland, OR)- Cañita, the downtown Portland Cuban restaurant (SW 6th and Burnside near Chinatown) is proud to announce an intimate evening of Afro-Cuban rumba music and celebration with Omo Iré. The performance will commence at 10 pm on Friday, February 28, at Cañita, at 503 W. Burnside. There will be a cover charge of $5 at the door. Please tell your friends to come early as it gets packed! Omo Iré features rumba musicians from Havana, Cuba, including master percussionist Miguel Angel Bernal Nodal and akpwón vocalist Juan D'Dios Ramos, joined by a 13 member ensemble of percussionists, singers, and dancers from Portland and Seattle. Bernal Nodal and Ramos are the founding members of Raices Profundas, hailed as the best new folkloric group in Havana, Cuba. 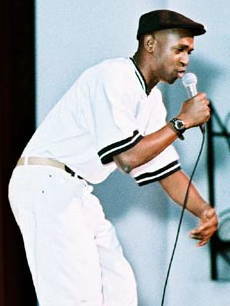 Juan D’ Dios toured for years internationally as a lead singer in the original Conjunto Foklorico Nacional de Cuba and Miguel Bernal Nodal as lead percussionist. 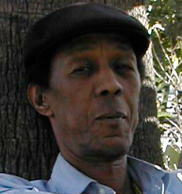 Rumba is the Cuban music form that draws heavily from African culture and percussion. African religions are widely practiced throughout Cuba, and in the singing and drumming of African religious ritual lay the foundations of Cuban music. Rumba music is played on wooden boxes and conga drums, accompanied by hand percussion and singers led by the akpwón, or lead singer. Dancers also play an integral part: their movements affect the rhythms of the music, and in turn, these rhythms govern their moves. The word "rumba" is used to describe the music, the dance, and the party where this all takes place. Cuban culture is strongly influenced by African religion from the Orixas, gods and goddesses from the Yoruba people of West Africa. The Yoruba culture's diaspora has strong roots and is a wide tree throughout the world. Each Orixa or deity has their own rhythm and dress and accustomed food they "like". Rumba and folkloric Orixa dances permeate Cuban culture and keep its strong ties with Africa alive. La Cañita is Portland’s destination for Cuban Creole cuisine and classic Cuban cocktails. Dinner is served from 5 pm to 11pm, but the kitchen stays open until 2:30 am, featuring La Cañita’s menu de media noche, or midnight menu. La Cañita is a follow-up venture to Pambiche, the acclaimed Cuban Creole establishment in Northeast Portland selected by Willamette Week as one of the Restaurants of the Year in 2002. Contact: Erick Hermann at (503) 285-6422 for more information or to book private classes with Omo Ire's Cuban musicians or send an email to: bata97203@yahoo.com to contact Miguel Bernal Nodal or Juan D'Dios. The 1st First Day Project, was a U.S. tour for a group of All-Star Afro-Cuban Drummers, Singers and Dancers in 2001.
featuring Miguel Bernal, Jose Barroso, and Susana Arenas of Raices Profundas, and Teresita Perez and Sandy Perez of Afro-Cuba de Matanzas.